Every so often I will spend a day riding the Metrolink commuter trains of the five county run operations in Southern California. One of my favorite trips is the one I am about to tell you. It can all be done with off peak tickets and is a good way to spend a day riding trains. 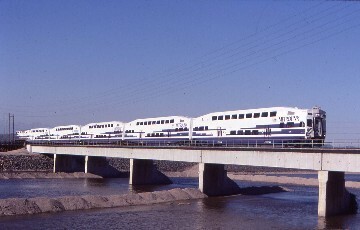 This train is one of the Inland Empire to Orange County trains which was the first suburb to suburb service in the world. I drove down to the Santa Ana train station and went to the Metrolink ticketing machine to get my ticket. I waited until after 8:30 AM so it would be off peak and first pressed the Adult round trip button and then San Bernardino so I would have a round trip ticket to use. I would reboard at Riverside on the return trip. About four minutes after I had my ticket in hand from the south I heard a whistle and the Metrolink train came into view. The doors opened and I went upstairs riding my usual seat with a vent on the side for a foot rest. The train whistled off and I was on my way to San Bernardino. We crossed the Santa Ana Freeway then went through my neighborhood which Metrolink wants to double track which I am all for. The single track between CP La Veta and CP Lincoln is the biggest bottleneck not only for Metrolink but also for Amtrak in its Pacific Surfliner corridor. We crossed Santiago Creek before ducking under the 22 Freeway. We regained the double track before we crossed Chapman Ave and arrived at the Orange Metrolink station. The old Santa Fe station is now a Cask and Cleaver restaurant. At CP Maple we went straight onto the Olive Subdivision towards Atwood. Along here you can see what's left of the former PE line to Marlboro. We passed the point where the old SP Tustin branch used to cross the Olive District. A little further on we ran along Orange-Olive Road which took us to the Santa Ana River. After we crossed the river and the 91 Freeway we arrived at Anaheim Canyon. On the move again, a few minutes later, we arrived at Atwood where we turned onto the BNSF's San Bernardino Sub mainline for its name sake city. We ran along Orangethorpe Ave, a few miles later crossing Imperial Highway then out into Santa Ana Canyon. The conductor came though the train checking tickets which he only looks at to see if they are valid. Through the housing projects we went out to Esperanza where the double track became triple track. We rounded the Horseshoe Bend as we went east through the canyon. Once we escaped the housing developments, we ran through the last natural part of the canyon then by the Green River Golf Course. We crossed high above the Santa Ana River before passing below the 91 Freeway where the triple track ended. We curved above the buildings below with Prado Dam in view before we made a big turn prior to running under the freeway again which took the train to the West Corona stop. A few minutes later, we ran through downtown Corona then beneath both the 91 and Interstate 15 Freeways. We passed through Porphyry and minutes later arrived at La Sierra where a few school children detrained. On the move again, we passed through Arlington and Casa Blanca before we curved between the hills that took us to West Riverside where the Union Pacific joined the BNSF mainline for the trip to Daggett east of Barstow. We came to a stop at the Riverside Metrolink station where most of the remaining passengers on the train got off. We ran through Riverside under the Interstate 215/CA 60 Freeway before we ran through Highgrove where the San Jacinto line departs the mainline. We crossed over the 215 Freeway before dropping down the hill to the Santa Ana River bridge. We ran through Colton crossing the UP ex SP Sunset Route} and under the Interstate 10 Freeway. We passed the ex UP station before we took the "Short Way" crossing Lyle Creek Wash and arriving at the San Bernardino Metrolink Station. I told the conductor that I needed to get a ticket so I ran to the machine and got a round trip off peak ticket to Los Angeles which I could use to return to Riverside on this afternoon. We left on time and after passing the Jct with the "Short Way", we climbed up and over the Metrolink Flyover that takes the trains over the busy BNSF mainline shared with the Union Pacific. Looking down I could see the Santa Fe 4-8-4 3751 waiting for its next future trip and home since it is stored outside. We passed the BNSF grain car facility before running beneath the Palmdale Cutoff. We rounded a curve before heading due west to the station stop at Rialto. We ran by the industries with San Gabriel Mountains to the north to our next stop at Fontana. The Conductor came through inspecting tickets, walked right by me since he knew I had bought one and nailed three people for having children tickets. He gave all three tickets for not having the right ticket. We passed through the BNSF Kaiser Yard before running by the California Speedway at the former site of Kaiser Steel. We ran by the industries before ducking under the Interstate 15, by the warehouses to the Rancho Cucamonga station. From here to Pomona the line has a streetcar feel to it with stops every few minutes. We stopped next at Upland at the former Santa Fe Depot before sprinting to the huge park and ride station at Montclair. Claremont came a couple of minutes later at the ex Santa Fe station there. We left the former Santa Fe 2nd District for the ex PE, later Southern Pacific Baldwin Park Branch before arriving at the Pomona station with the former Santa Fe station just to the northeast. We ran along the north side of the LA County Fairgrounds right along the drag race track. From here we would be passing between the houses as we ducked under the 57 Freeway to our next station stop of Covina. We parted the homes until we reached the south end of the deep gravel pits where we turned southwest to the stop at Baldwin Park. We ran by the factories, under Interstate 10, by an old drive in used as a swap meet and down to the ex Southern Pacific mainline where we turned to ran alongside of. We climbed to cross the flyover above the San Gabriel River and the UP's Sunset Route before ducking back under the Interstate 10 and pulling into El Monte where we met an eastbound Metrolink train for San Bernardino. We left the Sunset Route, climbed the bridge that took us high above the Rio Hondo and everything else to get us to the underpass that led the train to the middle of the San Bernardino Freeway. We cruised by the traffic which was stop and go to the junction of the Long Beach Freeway before we left the freeway's middle to reach the Cal State Los Angeles station. The train continued on the north side of the freeway ducking under Interstate 5 before passing below the junk yards to reach the east bank of the Los Angeles River which we crossed at Mission Tower prior to reaching the throat of Los Angeles Union Station. We pulled into Track 6 and I detrained heading to Felipe's for lunch and had a French Dip Roast Beef Sandwich. I waited up on Track 7 for the Riverside Line train to pull in. Once on board, the train left right on schedule going back out to Mission Tower and across the Los Angeles River. We stayed along the east bank of the river across from the Amtrak Coach Yards. We ran below the Sear's Building before curving away from the river and running to the Union Pacific East Los Angeles Yard. We ran along the north side of the yard to the crossing of the Santa Ana Freeway. We passed the Union Pacific East Los Angeles station and picked up speed to our first station stop of Montebello. The conductor inspected the tickets as we picked up speed crossing the San Gabriel River, went through the junction of the Puente Branch at Bartolo before ducking under the 605 Freeway. We saw Rose Hills Cemetery on the Puente Hills before we sped under the 60 Freeway and sprinted through the City of Industry. We passed through Puente Jct and sped east through the Puente Valley to our next station stop of Industry. The train continued its racing ways under the 57 Freeway and into Pomona. He we ran along the Sunset Route, passing the old SP Pomona station. We ran along the route to Montclair where our UP route turned to the southeast after passing through Ontario. Our next stop in our sprint east after passing the Ontario Airport was at East Ontario. We continued running southeast until we reached Pedley where our route turned south taking us to The Pedley Station. We turned east running along the Santa Ana River on the bluff before we crossed it on a ten high arch concrete bridge. We ran through Streetor and turned east running through the neighborhoods before running along the north side of the Pachappa Hill. We crossed over the 91 Freeway into the Riverside Metrolink Station ending this trip. The Riverside Line is a true high speed race track for Metrolink. I had to use the new pedestrian bridge to get to the south platform to wait for my train to arrive from Orange County. I got my walking in and enjoyed the passing of two BNSF freight trains. The trip home was the same way I had come out this morning and was a relaxing ride home.